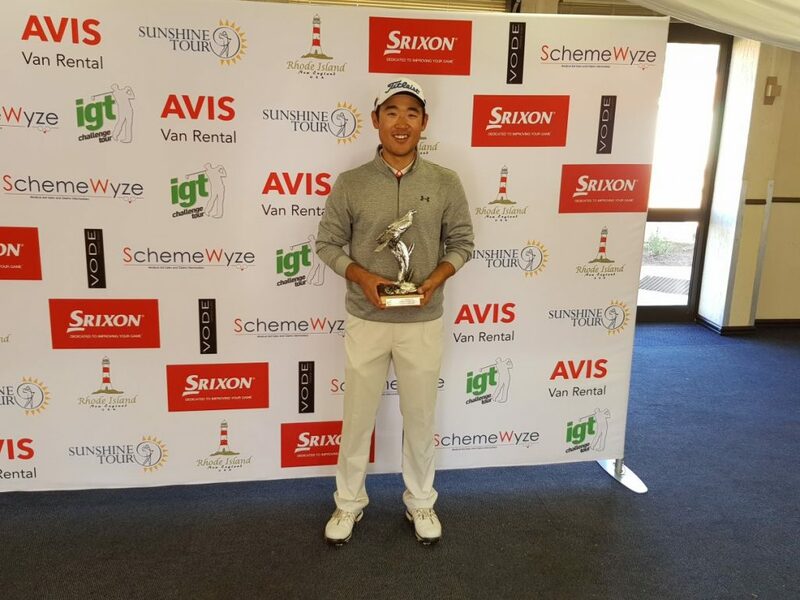 ALBERTON, 25 July 2018 – A cool head and mental fortitude helped DK Kim to withstand a back nine scare from Belgian Gary Daoust and earned the Korean a second IGT Challenge Tour title at Reading Country Club in Alberton on Wednesday. The Randpark golfer closed with a one-under-par 71 to triumph by three shots on 11-under 202. “I’m incredibly proud of this victory, because it’s the first stroke play event I’ve won since I joined the pro ranks and I did it under huge pressure from Gary,” said Kim, whose maiden win on the country’s premier golf development circuit in 2013 was in a match play event. Kim and Daoust both fired rounds of 65 on day two, but the Korean golfer carried a two shot lead on 10-under into the final round. “I was a little nervous at the start, because it was the first time I led going into the final round. It was positive tension, though and I was excited to see how I would cope,” said Kim. Kim made birdies at two and four, but dropped back to 11-under after a three-putt bogey at six. He took a four shot lead into the back nine after Daoust dropped two shots at the par four sixth and his lead grew to five after he birdied 10 and Daoust had another bogey. “Then Gary caught fire and he piled on the pressure with four birdies in a row from 11. Just like that he got to 10-under,” said Kim. With his Wanna Be A Champion Academy stable-mate suddenly just two shots off the pace, the 28-year-old Kim responded to the pressure with the poise of a veteran. “Every time I thoughts about the lead shrinking or Gary catching me came into my head, I told myself to just play shot for shot. I stayed calm and I stuck to my game plan,” Kim said. Daoust got a little too aggressive in his bid to catch Kim and paid the price with a double bogey at the par four 16th. “I had a four shot lead playing the last hole and I hit the worst tee shot of the day,” said Kim. “I pushed my drive way right under the trees and all I could do was to punch it out. But I hit a good third into the green. I was on the edge and gave the par putt a bit too much and it rushed past the hole, but I just slowed things down and made the return for the win. Daoust parred the final two holes for a 71 to take second on 205. Gilson Filho from Brazil fired three successive rounds of 69 to finish third on six-under, while Gary Player School of 2018/2018 members Allister de Kock and Derick Petersen shared fourth on four –under after closing with respective rounds of 71 and 70.